When I reviewed Deutsche Grammophon 4790913 last year, I cited that set as a mandatory acquisition for anyone who loved the piano. That box, which housed the great Maurizio Pollini's Beethoven, Brahms, and Mozart concertos, was reasonably priced and generally well selected. So is this one. Now, naturally you'll have to duplicate some stuff if you invest in both boxes. Also, if you're a long time collector, you'll have almost all of these recordings. The earlier box housed some rare imports, but the present set does score points for containing some repertoire that your everyday collector might be missing. More importantly, most of these recordings show both pianist and conductor at their very best. Say what you will about Abbado, but he was generally a terrific concerto accompanist. Unlike his work with Martha Argerich, Pollini's recordings were captured before both his decline and interest in small, period-influenced ensembles. And so we find superlative Bartók from Chicago, and a fine Choral Fantasia (Beethoven) from Vienna. As I wrote previously, the Brahms Second Concerto – also from Vienna and set down in 1976 – may be one of the finest documents of these artists working together, and is easily the better of the two accounts found in this box. The live 1995 Brahms concertos from Berlin aren't bad, but they aren't special, either. The Beethoven concertos are in Berlin. 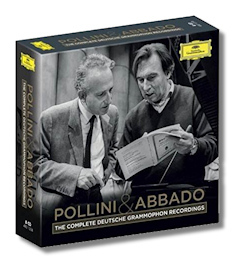 I wrote this previously: "This set has been critically acclaimed, but I can't shake the notion that I prefer Pollini's earlier collaborations with Böhm and Eugen Jochum. While Abbado proves a sensitive and intelligent accompanist, I've not convinced by the somewhat soggy attacks in the early concertos or the rather faceless brass and winds. Pollini plays objectively; with a somewhat hard sound that pinpoints the music's classicism. Abbado doesn't clip his phrases like his later readings with Martha Argerich, but soloist and conductor are heard to better effect elsewhere." That review left out the 'Emperor' which was with Böhm in Vienna; that version is again marginally preferable to the one included here. Abbado recorded the Schumann Concerto three times, twice in Berlin. None of the three are what I'd consider a reference recording, but all of them are never less than respectable. Pollini is as serious an artist as they come, but even the poker-faced Rudolf Serkin was able to make a slightly more colorful account. On the other hand, this Schoenberg Concerto is quite fine, and the Nono is an unusual work that is very well done. While I'm not sure if this box has the essential nature of the previous set (those early recordings and the late Mozart are oh-so-compelling), fans of the conductor and pianist can buy the complete Argerich/Abbado box to go with this one and be very happy.